If you want to book a Beijing Tour during your visit in China, one of our English speaking tour guides can help. Use the form on this page to contact us and we will help make your travel a memorable experience. Beijing, once known as Peking is the capital of China and it stands out among the most populous city in China. Beijing Municipality is encompassed by Hebei Province except for neighboring Tianjin Municipality toward the southeast. Beijing is the second biggest Chinese city by urban populace after Shanghai and is the country’s political, social, and educational center. It is home to the central command of the greater part of China’s biggest state-claimed organizations, and is a noteworthy center for the national expressway, railroad, and fast rail systems. The Beijing Capital International Airport is the second busiest in the world by traveler traffic. Beijing serves as more than just the capital of China, instead it provides a pivot for visitors of modern architecture alongside its famous ancient sites such as the Grand Forbidden City Complex. While filling out your request for a free quote for a memorable and interactive Beijing tour guide, know that your experience will be filled with a city that has a history that stretches back three millennia. 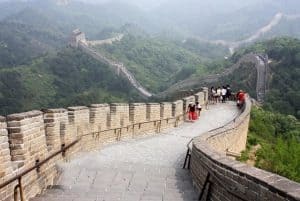 This tour of Beijing will serve any history buff well as I take you to the Great Wall of Beijing with specific sections of the wall that are packed with history of the separate dynasties that ruled that land that date back to 206 BC. Then, we can head over to the Ming tomb that dates back to the 11th emperor of the Ming Dynasty. Nearby, the Temple of Heaven is originally the place where emperors of the Ming Dynasty held the Heaven Worship Ceremony that was built back in 1420. This medieval complex is surrounded by an extensive park that totals to 660 acres that host not just a place of playgrounds and exercise space, but also for choral shows and ethnic dances in the morning. If hiking the Great Wall or experiencing the ancient times of dynasties isn’t for you, head over to the modern part of the city where the Beijing Zoo, founded in 1906 and is one of the oldest zoos in the country. At night, the city has a few surprises in store for you with either traditional performances, acrobats, or martial arts or you can see something more modern with the local clubs and concerts. At the chronicled heart of Beijing lies the Forbidden City, the colossal castle exacerbate that was the home of the emperors of the Ming and Qing dynasties; the Forbidden City has the Palace Museum, which contains royal accumulations of Chinese arts. Encompassing the Forbidden City are a few previous royal gardens, science areas and parks, eminently Beihai, Shichahai, Zhongnanhai, Jingshan and Zhongshan. These areas, especially Beihai Park, are portrayed as showstoppers of Chinese gardening art, and are famous tourist attractions with enormous verifiable importance; in the advanced period, Zhongnanhai has likewise been the political heart of different Chinese governments and administrations and is currently the central station of the Communist Party of China and the State Council. From Tiananmen Square, right opposite the Forbidden City, there are a few eminent locales, for example, the Tiananmen, the Great Hall, the National Museum of China, the Monument to the People’s Heroes, and the Mausoleum of Mao Zedong. The Summer Palace and the Old Summer Palace both lie at the western area of the city; the previous, and UNESCO World Heritage Site, contains an exhaustive accumulation of majestic patio nurseries and royal residences that served as the retreats for the Qing supreme family. To hire a Beijing tour guide just fill out the form on this page to request a free quote.